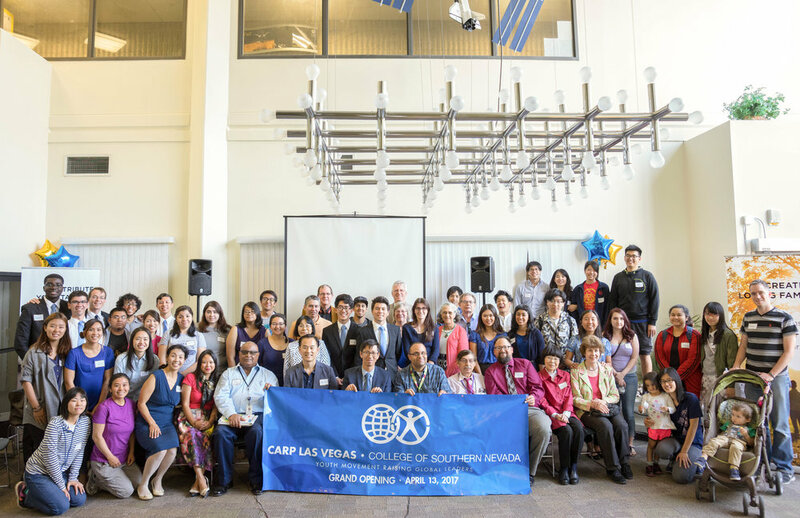 On April 13th, CARP Las Vegas held its grand opening for the College of Southern Nevada (CSN) chapter. The event brought together CSN students, CARP members, local Unificationists, and eight CSN professors and faculty. CARP members were touched by a recent message given by Mother Moon (co-founder of CARP), where she expressed to CARP members nationwide to establish a culture of heart on their campuses. In response to Mother Moon’s direction, CARP UNLV and CARP CSN members reached out to professors at both universities for several weeks before this grand opening in hopes to share this message. The members were proud to be able to share the founders’ vision for CARP and for America at the opening ceremony. With CARP UNLV president, Jinil Fleischman (read his testimony here), as emcee, the program started with a musical offering by CARP members Angelica Moraes and Kailey Teo. Angelica is a member of Apple Heaven USA and performed in Korea at Father and Mother Moon’s birthday celebration. The two performances moved the hearts of the audience with an ode to America’s ideal. Following a video highlighting CARP’s past activities, the new president for the CSN CARP chapter, Chungbom Katayama, then gave a presentation on the vision for CARP and the new chapter at CSN. He testified that Father and Mother Moon are the ones who understand the root of the problems facing society and are determined to resolve them. Two CARP members followed suit in sharing their testimonies. Ryota Naito shared about how studying the Divine Principle in CARP empowered him to practice true love and make a change in his own family. Then, Angelica Moraes testified to Father and Mother Moon’s vision to create a culture of heart in America. 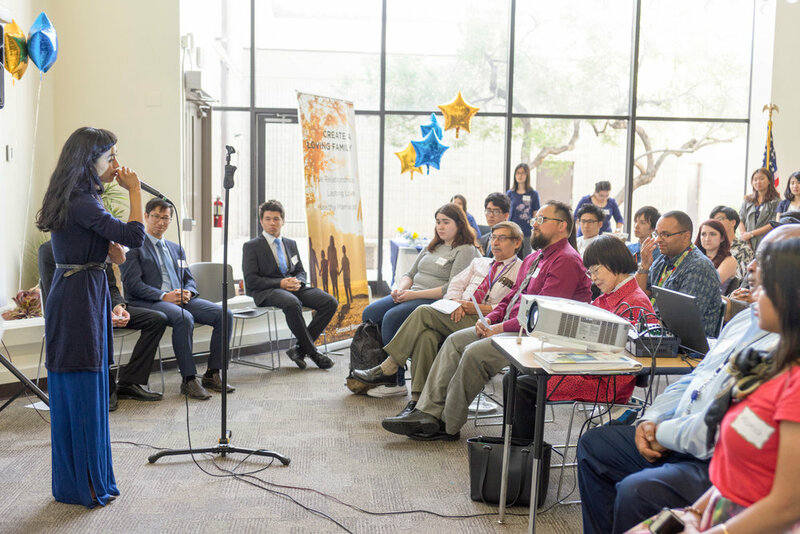 She shared about her struggle with the self-centered culture that she experienced, but conveyed her hope to build a heavenly culture in sharing Father Moon’s words about how America was prepared by God for this specific purpose. Akira and Makiko Watanabe, the directors of CARP Las Vegas, closed out the program with some concluding remarks and encouraged all the CSN faculty to be involved in teaching the youth to fight against a self-centered culture in order to create a culture of heart. The CSN faculty were very moved by the program and by the vision of the CARP students. One professor had to hold in her tears because she was so moved by the values that CARP stands for. Another faculty member expressed that the CARP students can accomplish great things. He was so inspired by the spirit of the CARP members that he volunteered himself to provide mentoring for the club on a weekly basis. One professor who had a CARP student in his class encouraged all of his students to skip part of his class in order to attend the opening ceremony. Many professors expressed that they are eager for the next CARP event at CSN, and are looking forward to collaborating more with the club members. CARP Las Vegas has been active on the UNLV campus since August 2014. At the start of 2017, CARP students dedicated themselves to creating another Las Vegas chapter at CSN by engaging in outreach on the campus. With sincere devotion, they were successful in their campaign to recruit enough students and find faculty advisors to establish CARP as an official club at CSN. The new and more seasoned members are excited for how they can continue to share the founders’ vision for the young adults at CSN and all of Las Vegas!